Need help selecting a Bedwetting Alarm? We have compared the best alarms so you can see for yourself which is ideal for your specific needs. Bed wetting boys and girls are usually very deep sleepers and need alarms that will wake them up almost immediately on detecting urine. Further in most cases, bedwetting in children is something the family has been dealing with for a while before proactive measures are taken. We have spent time analyzing several bedwetting alarms for boys and girls and selected only the very best to stop bedwetting in children. Each of these alarms are manufactured by reputable manufacturers and known leaders in the bedwetting space. We have compiled below a list of the best bedwetting alarm for children for 2019. Each of these alarms comes recommended by us to stop bedwetting in children ages 4-12. Each of these alarms offers unique features to stop bedwetting in children. Bedwetting is caused by genetics and is usually runs in the family. Boys are about 2x more likely to wet the bed compared to girls. In the USA, there are about 7 Million cases of bedwetting in children. Yet, many of them go untreated due to lack of awareness. A bedwetting alarm when used properly can stop bedwetting in children. Children are usually deep sleepers and need parental assistance throughout the treatment. Many children will not wake up to the alarm the first few weeks and parents will need to wake up children. For this reason, we recommend using a loud alarm, one which can be heard by parents in other rooms. Also, many parents go on frequent trips and vacation with bedwetter children. In times like these, a small and compact alarm can come handy. So before you can purchase an alarm, its important to first decide the age of the user and then accordingly invest your money. Generally speaking, there are two types of alarms – wearable alarms and bedside alarms. Wearable alarms are more popular to stop bedwetting in children. Bedside alarms are more popular for teens and adults. Wearable alarms are also many more in number and include popular best bedwetting alarms like Chummie Premium, Chummie Elite, Smart, Shield Prime, Shield Max, NewU, Zest and Ace. Bedside alarms include Chummie Pro, Smart Bedside and Boost bedwetting alarm. For bed wetting boys and girls, we recommend getting an alarm with sound, light and vibration so even the deepest sleeper will wake up. Faint alarms are generally ineffective and will only delay treatment in most cases. Get an alarm with loud sound, bright lights and strong vibration. An alarm with different alert tones is generally preferred as it will play a different tone every night and your child will not get used to one single tone. If comfort is important, get an alarm compatible with the Comfy Armband. Before we selected the best bedwetting alarm to stop bedwetting in children, we analyzed several alarms carefully. We looked at the construction, reviews, manufacturers website and tested every product ourselves. Every alarm was tested thoroughly before we decided to include it in our top 10 best bedwetting alarm for children for 2019 list. All bedwetting alarms work on the principle of behavior modification also called behavior conditioning. There is generally a urine detection sensor or pad and an alarm unit. The sensor is taped or clipped outside the underwear while if there is a mat, it is placed on the bed. The alarm unit is either clipped on the t-shirt, placed on the arm using a comfy-armband or placed on the table (bedside alarm). On detecting urine, the sensor sends a signal to the alarm unit which in turn alerts the user using sound-vibration-light. Once awake, the child uses the bathroom. Over time, the child wakes up sooner and sooner and eventually wakes up before wetting the bed. These alarms are very successful to stop bedwetting in children. When using an alarm for a bed wetting boy or girl, it’s a good idea to purchase a waterproof mattress pad. These are also called washable mattress pads or waterproof bedding. They protect the bed from urine stain and smell. Another option is to also have handy urine stain removers. A highly recommended product for use with a bedwetting alarm for children is the Comfy Armband. It is a pouch in which you secure your alarm unit at night and wear like your sports armbamd. This site compares some of the best bedwetting brands and gives shoppers prices from a number of stores. 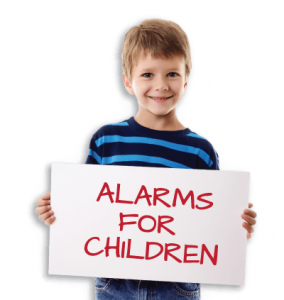 We aim to make shopping for bedwetting alarms easy and simple. © 2019 Best Bedwetting Alarm. All rights reserved.